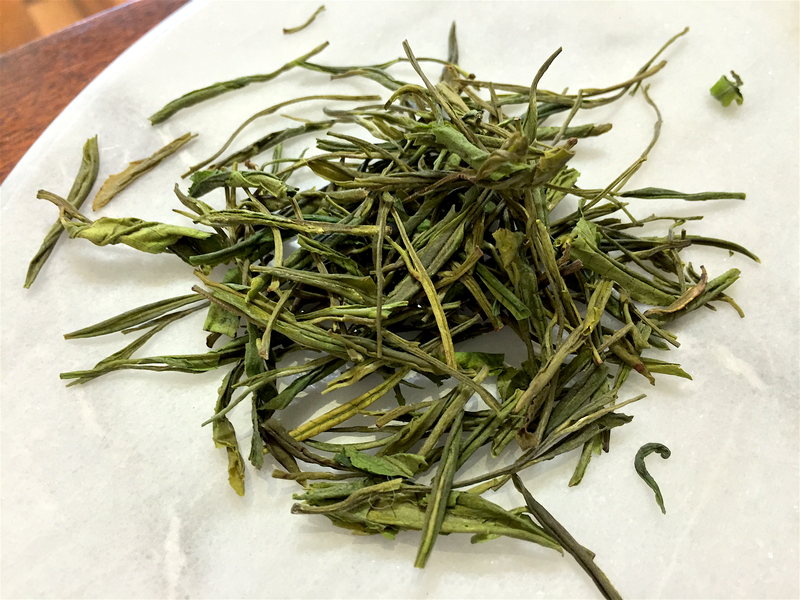 Anji White, also known as Anji Bai Cha (安吉白茶), is a comparatively rare high grown Chinese Green cultivar. Although called Anji White, Anji Bai Cha is actually a Green (no doubt to confuse us). Anji Bai Cha is a sweet and woody/earthy Green grown only in Zhejiang (home of many of China’s most refined teas). Picked only during a 30 day window in early spring, Anji Bai Cha buds are delicate, grey-green and high in Thiamine. Today I’m drinking Goldfish’s Anji White. In aroma, Anji White is clearly a highly vegetal Green with a forest note. The liquor coloration of this Chinese Green helps shed some light on its mysterious name, as it appears quite clear with a Yellow-tinge not unlike a Peony. In flavor however, Anji White is actually quite unique. A light, sweet and refreshing Green with very low astringency for its region and style, Anji White is actually more similar to a sencha or fukumairicha than to most Chinese Greens. In texture Anji White is very Tippy and elegant–tumbling and sliding along the back of the tongue long after I’ve taken a sip. For those who dislike most Chinese Green’s astringent character or prefer Japanese sencha styled Greens, I would highly recommend Goldfish’s Anji White. Quite the impressive sh0wing! I was bowled over by this highly-drinkable, highly refined Zhejianger Green. Anji White also has the distinguished honor of being the first tea I’ve reviewed in my new infuser: a Forlife bola. So far results have been very promising, though i haven’t concocted the perfect method for cleaning spent tea out of the infuser basket as yet. Anji White (Goldfish) ~ loose leaf by Jocilyn Mors is licensed under a Creative Commons Attribution-ShareAlike 4.0 International License. Anji White (Goldfish) ~ loose leaf macro by Jocilyn Mors is licensed under a Creative Commons Attribution-ShareAlike 4.0 International License. Anji White (Goldfish) ~ spent by Jocilyn Mors is licensed under a Creative Commons Attribution-ShareAlike 4.0 International License. Anji White (Goldfish) ~ spent macro by Jocilyn Mors is licensed under a Creative Commons Attribution-ShareAlike 4.0 International License. Anji White (Goldfish) ~ liquor by Jocilyn Mors is licensed under a Creative Commons Attribution-ShareAlike 4.0 International License. Anji White (Goldfish) ~ bola by Jocilyn Mors is licensed under a Creative Commons Attribution-ShareAlike 4.0 International License. Anji White (Goldfish) ~ bola 2 by Jocilyn Mors is licensed under a Creative Commons Attribution-ShareAlike 4.0 International License. Anji White (Goldfish) ~ bola 3 by Jocilyn Mors is licensed under a Creative Commons Attribution-ShareAlike 4.0 International License.